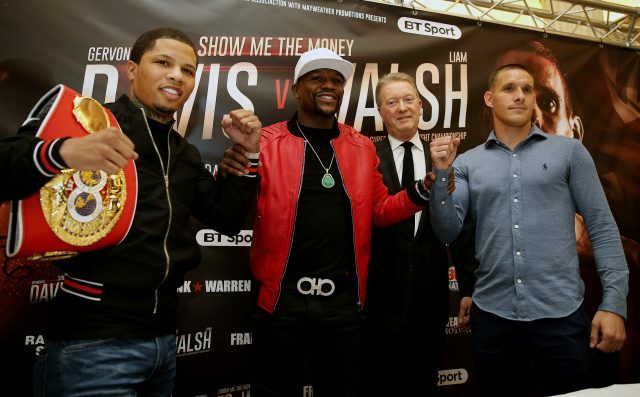 LIAM WALSH is to fight Floyd Mayweather’s protege Gervonta Davis after repeated visits to Las Vegas to watch the American fight. The 30-year-old challenges IBF super-featherweight champion Davis at London’s Copper Box Arena on May 20, and does so with Mayweather insisting the Briton is capable of reaching the same heights he once did. Mayweather, 40, again refused to discuss the possibility of him returning from retirement to fight Ireland’s UFC lightweight champion Conor McGregor, but in his capacity as Davis’ promoter is overseeing another fighter who has long admired him. 20th May in London ???????? “I’ve been to Vegas a few times to support Floyd,” Walsh told Press Association Sport. “I watched him against Ricky Hatton, went over for the (Manny) Pacquiao fight: I paid £400 to watch it on TV. We were Hatton-mad at that point. The undefeated Walsh has long appeared capable of challenging for a world title, but has had to wait almost five years for the chance to do so after being forced to withdraw from challenging Ricky Burns in 2012 after being hurt in a car crash. America’s Davis has since emerged as one of the world’s finest prospects, and – after a press conference in which Mayweather appeared to call him “Leon Walsh” and forget his name at another point – the challenger said: “It doesn’t surprise me at all (they don’t seem to know me). “Americans have got big egos – I do like the Americans, they’re winners and they support winners – but I didn’t think for a second they’d know who I am. “They’ve probably had a look at me before negotiations and seen something they fancy, they like. I know Frank’s paid good money to get them here but they’re obviously more than confident they’ll win; they wouldn’t be going to somebody’s backyard if they weren’t. “From an interview I read about Gervonta, he’s not a big boxing fan: he follows a few of his friends and that’s about it. And Floyd’s obviously got far bigger fish to fry than me.